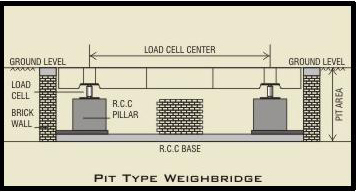 Diffrence Between Pit Type And Pitless Type Electronic Weighbridge. 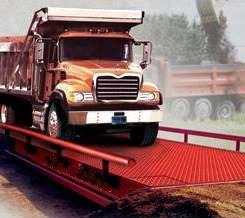 The Electronic Static Weigh-bridge is made up of a framework of girders adequately reinforced with transverse beams and suitable non-slip top deck with Pit less & Pit type Structure. 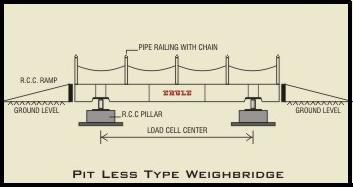 The entire steel framework is mounted on strain gauge double ended shear beam / Compression Type Load Cells (4, 6, & 8 No's. Load Cells), depending on length of the platform. The shear stress produced by the load is detected by a strain gauge, full bridge circuit and converted into an analog electrical signal. Signal from each loadcell is fed to Junction Box. Output from Junction Box is fed to microprocessor based weighbridge Microprocessor based weighbridge Intelligent Terminal. The processing electronics of terminal digitizers the signal from the Junction-box using an ADC, based on time proven quad slope integration technique and weight is registered on LED display. Designed, Hosted & Promoted by : AIRSON SCALE MFG.CO.